Many people ask Erica and I how we got started in the dog world. This page gives our visitors a little bit of history. In 1970 my parents purchased a black German Shepherd puppy “Dockal Tristan.” Not a kennel name you will see today. Tristan was sired by Ch. Tanaba Tanhausser C.D.X. “Strauss” owned by Max and Fay Stokes, bred by Tom & George Briggs. As fate would have it Max and Fay wanted to see Tristan and they convinced my non-show dog parents to show this little boy. About 2 months into the show ring my father lost the top of 3 fingers in an industrial accident and obviously couldn’t show our puppy. So at 13 years old, I was thrust into the show ring. That day Tristan won in a class of 6, and won his opposite. 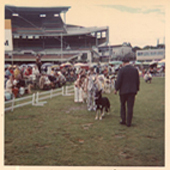 Back then black shepherds were not popular with judges and shepherd entries at shows were large. It didn’t take too long before I entered the junior showmanship classes. 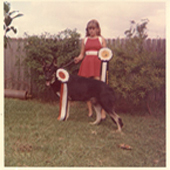 Tristan became my handler dog and I was soon known as the “little girl with the black shepherd.” It took a while before I finally succeeded in the handler classes with my first win at St. George Kennel Club Championship Show on 17th April, 1971. Mum & Dad encouraged me to enter the “Inaugural” Pal International Dog Show, Handler Class now known as the Spring Fair. In this class I was successful in being placed 2nd. You can imagine how proud I was when in 2007 my daughter Erica won that same class. 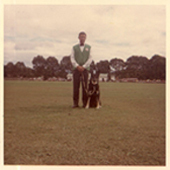 My parents, Bob & Rona Jones were office bearers in the German Shepherd Dog League for some years. Dad holding Show Manager position and mum holding Cumberland Branch Secretary. At this time I was the youngest instructor in the GSDL. I married in 1977 and was given a male puppy, “Bronson” as a wedding present. Not long after, dad died of cancer. It was for me, the end of special time and I turned my attention to family and career. I believe once something is in your blood it’s there to stay. So it was no surprise to my family after the birth of my 4th child, I needed a puppy!! Along came Minka – a beautiful golden retriever who was a wonderful family pet. In 1998 Minka delivered a litter of which we kept Merlin, the first BlueBreeze litter. It took a little more time however before I re-entered the show ring. I purchased a puppy – Japorik Princess Monarco, bred by Tony Saunders & Rika Yoshino. At her first show she won a 3rd place, I was proud as punch as Erica & I drove home with our little yellow ribbon. At Monarco’s second show, she won Best Baby Puppy in Group. That was it – I was hooked, again!! My next show golden was Dykinta Shades O Gold, bred by Wendy Atkins. Topaz became our first Champion. The rest of story, really, is in the website pages.